In 1886, Carl Benz built a motorized tricycle. His first four-wheeler, the Victoria, was built in 1893. 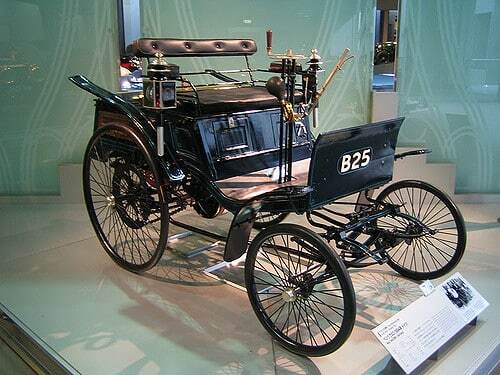 The first production car was the 1894 Benz Velo which participated in the first recorded car race, the Paris-Rouen race. In 1895, Benz built his first truck. 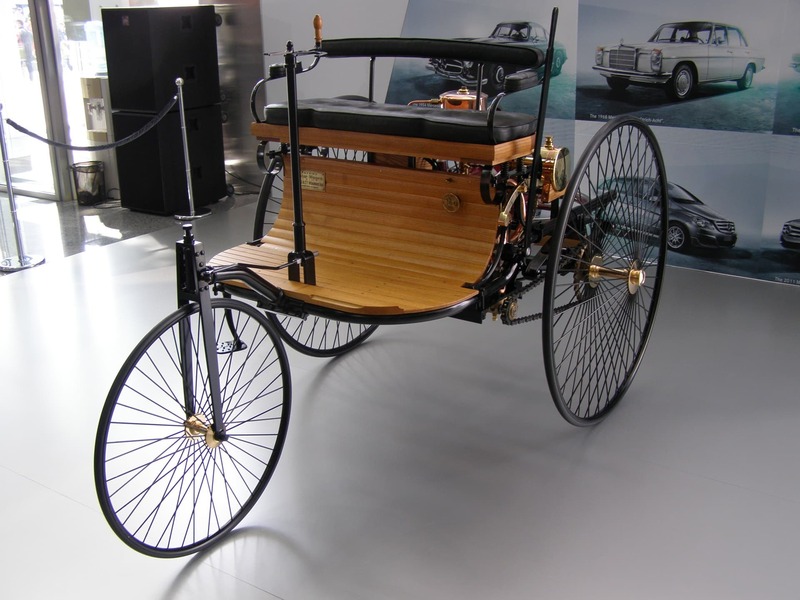 In 1886, Gottlieb Daimler literally built a horseless carriage. In 1888 Daimler made a business deal with William Steinway (of piano fame) to produce Daimler’s products in the US. From 1904 until a fire in 1907, Steinway produced Mercedes passenger cars, Daimler’s light trucks, and his engines on Long Island. Ironically, history says Daimler, generally considered to be the father of modern automobiles never liked to drive, if, indeed he ever learned to drive. When Daimler died, he left control of his company to his chief engineer Wilhelm Maybach. By November 22 of that year, Daimler-Motoren-Gesellschaft had produced a special car for Emil Jellinek. Jellinek named the car after his ten-year-old daughter Mercedes. Lighter and smaller, the new Mercedes had 35 hp and a top speed of 55 mph! The 1903 Parsifal was Benz’s answer to Mercedes. A two-cylinder vertical engine produced a top speed of 37 mph in this car. Aware of the promotional potential of racing, both Daimler and Benz entered many of them. However, up until 1908, Daimler had overshadowed Benz in racing endeavours. At the 1908 French Grand Prix, Benz took second and third place behind Lautenschlager driving a Mercedes. From that point on, both Benz and Daimler did well in racing. At the beginning of the first world war, both factories were converted into production sites for war materials, although both resumed producing cars after the war. Social unrest and a falling economy characterized post-war Germany. Little or no fuel for cars and a 15% luxury tax made automobile production increasingly disastrous. This market sent Benz and Cie. seeking a strong partner. The only one the board considered worthy of Benz and Cie was DMG. Thus, in 1919, Karl Jahn, a Benz board member since 1910, approached Daimler-Motoren-Gesellschaft about a possible merger. The merger attempt looked promising, then was abandoned in December of 1919. The German economy continued to worsen and a new Benz automobile eventually cost 25 million marks. Although nearly 15 million cars were registered in the world in 1923, over 80% of them were registered in the US and over 1/2 were Fords. Benz and Cie. built 1,382 cars in 1923 while DMG only built 1,020. German automakers were at a low point although racing success for the companies continued. In 1924, from sheer economic necessity, Benz and DMG signed an “Agreement of Mutual Interest.” Although both companies retained their identities, the agreement was valid until the year 2000. The two companies merged with relative ease on June 28, 1926. A symbol was chosen for the combined products of DMG and Benz. The new insignia was a three-pointed star wreathed with laurel. The word “Mercedes” was at the top and the word “Benz” was at the bottom. Then merger did the new company well. Production of Mercedes-Benz rose to 7,918 Mercedes-Benz automobiles in 1927. The Mercedes-Benz diesel truck was put into production in 1927, also. 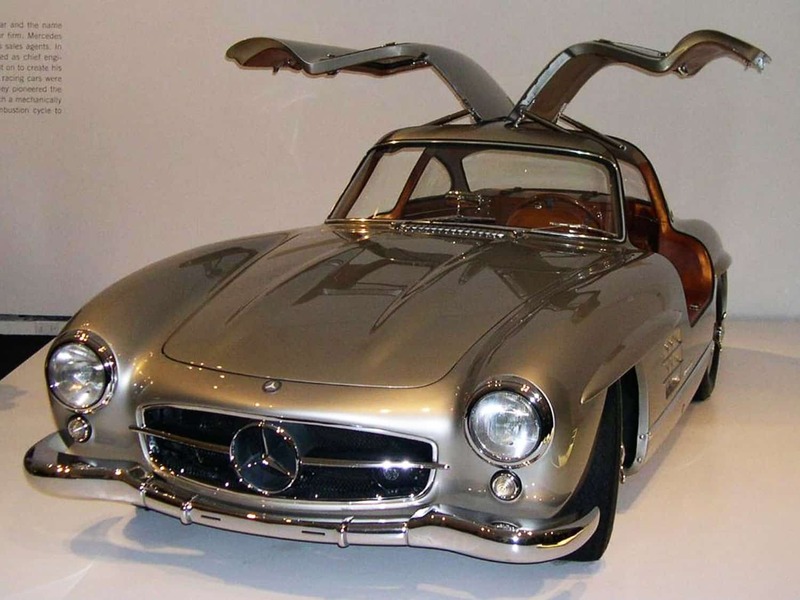 The first two automobiles to sport the Mercedes-Benz names were the Stuttgart and the Mannheim. Then in 1928, the Mercedes SS was introduced by Mercedes-Benz. This graceful body was made possible by a hood line that barely cleared the engine. Mercedes-Benz launched their biggest and most prestigious car to date in 1930. The 770 Grosser was powered by an 8 cylinder, 7.6 litre engine. A car for the truly wealthy of the world, it was quite an automobile for showing off in a world economy still reeling from the Wall Street Crash of 1929. The cars of the 1930s produced great racing success for Mercedes-Benz. The silver metal bodywork gave rise to the name Silver Arrows when the W25 racer (of Rudolph Caracciola fame) had the white paint removed to lower its weight. W125 (200 mph top speed) won seven out of thirteen races in 1937 followed by the successful W154. In 1939 Mercedes-Benz built small V8 race specifically to win the Tripoli GP It did win! The Mercedes-Benz 170V gave Mercedes the capability of surviving and then recovering from WW II. Servicing Mercedes-Benz since 1999, we are a Mercedes-Benz Mechanic and Mercedes-Benz Specialist, located in Perth, Western Australia.